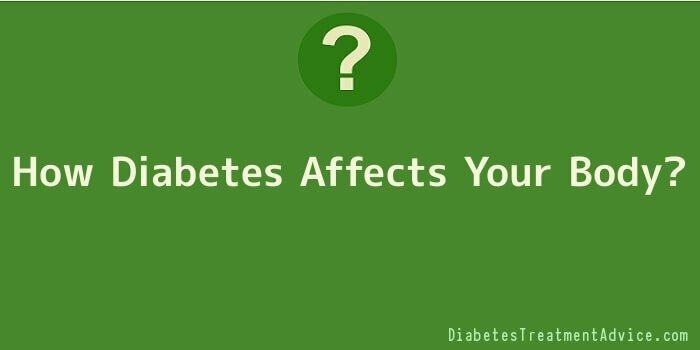 How Diabetes Affects Your Body? You should have an optical exam at least once a year. You can have problems that are unknown. When you catch them early, the chance of recovery with treatment is good. Early detection and treatment can lower the risk of glaucoma or blindness. If you have a high blood glucose level, you may experience bleeding in the blood vessels of your eyes. This can eventually lead to blindness. To prevent this, you must control your blood glucose so that it stays at a normal level. If your eyes are in an advanced stage of being damaged, you may be able to still save them with laser treatments or surgery. Prior to the exam, inform your doctor that you have diabetes. With an eye exam, the optometrist dilates your pupils with eye drops. When your pupils have dilated, the doctor can examine the back of your eyes to see if there are any abnormalities. Even if you don’t have any, it’s always good to have your eyes checked anyway. An eye exam is needed every year for people who have Type 2 diabetes. Women who are planning to start a family should have their eyes checked. If you’re 10 years old or older and have Type 1 diabetes, you should have an eye exam within three to five years after diagnosis of diabetes. After that, switch to yearly exams. Also, inform your doctor if you experience blurred vision, dark spots, flashing lights or rings around lights. If your blood glucose level is high, it can affect the nerves in your body. Nerve damage causes you to lose feeling in your feet. It can also cause your feet to experience a painful, burning sensation. It can also cause pain in other places, such as your arms, legs, hands, while you’re eating or going to the bathroom. It takes a while for nerve damage to affect your body. When it comes about, you may not be aware of it. Have your physician check your nerves at least once a year. Your physician should check your sense of feeling and your feet pulse. If you have any problems with your legs, feet, hands or arms, please advise your physician of same. Or if you can’t digest food properly, have trouble going to the bathroom, feeling dizzy or have trouble getting intimate. Severe nerve damage can lead to the amputation of your feet. Poor circulation due to your blood vessels not working can cause problems in your legs. You can also get sores on your feet. If the sores don’t heal an infection will set in. It’s imperative you get treatment for the infection, otherwise it can lead to amputation. If you already have nerve damage in your feet, it is critical that you take good care of them. If you are a diabetic, taking care of your feet is critical. One of the ways you can protect your feet is to keep your blood glucose level normal. There are other ways you can protect your feet from damage or risk of amputation: You should check your feet every day, without any footwear. Check for any red spots, bumps, sores or cuts. Use a mirror so you can see and ask someone for assistance if you have trouble. Your feet should be washed in warm water every day. Don’t soak your feet and use mild soap on them. Your feet should be dried with a soft towel and dry carefully between your toes, removing any excess moisture. Put lotion all over your feet after washing, except between your toes. Use an emery board to file your toenails straight across. Your toenails should not be sharp after filing. This can cause other toes to be cut. If you have corns or calluses on your feet, don’t use a razor blade or a knife. Also, avoid using wart removers. See a podiatrist if you have warts, painful corns or calluses. Wear thick, soft socks only. Avoid wearing sewn-up stockings or ones that have holes or seams and can rub against your feet. Make sure your shoes don’t have any sharp edges or objects in them. Your shoes should fit well and have enough room for movement of your toes. Take your time breaking in new shoes. You should never walk around without any shoes on at any time. Avoid wearing flip flops, pointed-toe shoes or plastic shoes. If your feet get cold at night, put on some socks. Avoid using heating pads or hot water bottles on your feet. Your feet should be checked by your physician at each visit. Remind your primary physician to check your feet by taking off your shoes and socks. If you have further difficulty with your feet, see a podiatrist. Kidneys assist in removing the waste products from your bloodstream. They also maintain a balance of salt and body fluid. If your blood glucose level is high, that has an adverse affect on your kidneys. A high blood glucose level can cause kidney failure. Kidney failure usually means you have to get dialysis, which cleans out the toxins in your blood. Or you may have to get a kidney transplant. Keep your levels of blood glucose and blood pressure as normal as possible. Try not to get a bladder or kidney infection. If your urine is cloudy or shows signs of blood, burning sensation while urinating, frequent urination, back pain or chills, these may be signs of one of the two.